As we age our skin loses its elasticity, firmness and moisture. What should we do? Apply more moisturizers, essence, cream, mask and etc… I just tried the latest rescue for my aging skin. Tadah!!! Here is the Drops of Youth Bouncy Sleeping Mask by The Body Shop. 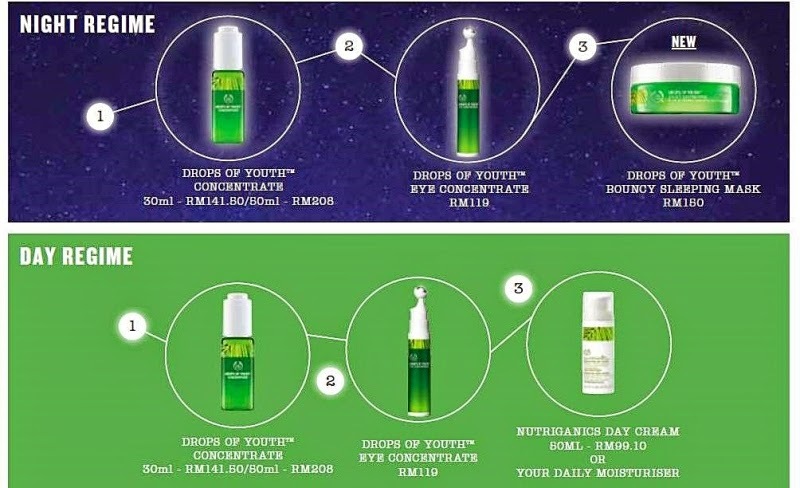 This is one of their best-selling youth enhancing skincare range. Sleeping mask can come in very handy at times, especially for the lazy girls hehehe… After a long night partying and outing what I really need is to wash all my makeup off, had a shower and apply my skincare plus put on a sleeping mask before I go to bed. That the next morning I woke up looking fresh and ready to conquer the world again. Drops of Youth Bouncy Sleeping Mask comes in a glass jar so handle with care, once it dropped on the floor is gone. The mask is in off white color and the texture is like thick yoghurt and gel. I apply it all over my face including my neck and go to bed. I love the fresh green scent and also the cooling sensation. It is relaxing. One of the main ingredients is the Edelweiss stem cells for skin rejuvenating. To me this Bouncy Sleeping Mask is quite rich so I use it like twice a week or as and when my skin feels tight or dry. Please take note that the texture is a bit thick and slight sticky compared to the other water based sleeping mask that I tried before. But the moisture effect is good and has the firming effect. The next day I can see my face look fresh, smooth and supple. Overall, this sleeping mask is a moisture rescue for those who have dry and aging skin. For those who have oily or acne skin type you might want to use the water base sleeping mask. 2. During beach or sunny holiday after a long day outdoor you need this mask to soothe the skin and replenish back the moisture. 3. On cold temperature places where you need to lock in the moisture and maintain the skin hydration balance. Availability: The Body Shop Drops of Youth Bouncy Sleeping Mask is now available at all The Body Shop counters and stores.